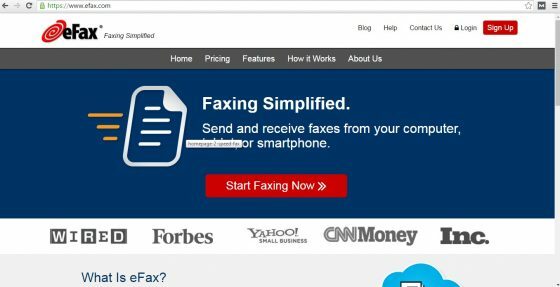 eFax is one of the most flexible online fax service that provides you with the ability to send and receive faxes through email and on your mobile device. Even with its non-competitive pricing with respect to other fax services, it provides numerous advanced features which make it a perfect fit for small businesses. With eFax Plus plan, you get service for sending and receiving 150 faxes each. It provides a considerably lower number of faxes than most of its competitors. After exceeding this 150 faxes limit in both cases, sending and receiving, it charges 10 cents per page after exceeding this limit. This plan can be suitable for small businesses that don’t have significant requirement of sending a higher volume of faxes. This plan is comparatively costlier than its competition, but you can save some bucks by opting for an annual plan rather than going for a monthly plan. Talking about its features, it provides several noteworthy features which make your faxing experience quite easy and hassle-free. It integrates perfectly with Microsoft Outlook and other popular email clients, which allows you to send and receive faxes as email attachments from your mail inbox. It also provides digitized signature which provides you with the ability to sign your faxes online. You can easily create a signature stamp which you can drag and drop into your faxes. The most salient feature of this service is its large file sharing along with access via mobile. By using your online fax account, you can send and receive files which are considerably larger for email. This service also has Android apps and apps for iPhone which make it seamlessly easier to send or receive faxes using your smartphone. Another significant feature of this service is an innovative, intuitive and intelligent interface. Its initial home screen is split into four different categories which provide easier navigation on your fax account. With its message centre, you can easily send and receive faxes which perform similar to an email client, making it easier for users to get familiar with this service. Coming on to the support structure, eFax provides 24 hours toll-free telephonic assistance and email support too. With its extensive list of FAQs and user guide, you can easily find out solutions in case you get stuck while using this solution. You can download the user guide from its website which provides stepwise instructions and various tips on queries related to faxing and navigation.